The texture of these cookies depends on three things: not overmixing, rolling the dough a full 1/4 inch thick, and baking just until done. Roll the dough out on a lightly floured counter to 1/4 inch thickness and cut, then transfer the cookies onto cookie sheets that have been lined with parchment paper or silicone liners. If desired, use a paring knife to score a pattern on the cookies to resemble the pleats in a cupcake liner. Bake 8 to 10 minutes, until the surface of the cookies looks completely dry and set. Let the cookies cool slightly on the sheets, then transfer to a wire rack to cool completely before frosting. Fluffy White Frosting Makes enough to frost 18 cookies, or one 8 inch layer cake This is a simple, basic egg white recipe that makes a glossy, fluffy frosting. Make sure your bowl and beaters are clean and grease free before whipping the egg whites. A standing mixer is helpful for this recipe; a hand-held mixer will take longer to whip the frosting fully. With mixer running, add hot sugar syrup to egg whites in a slow, steady stream. Beat egg whites until very thick, glossy, and stiff, 7 to 10 minutes. Spoon frosting into a pastry bag fitted with a star tip and pipe onto cookies. 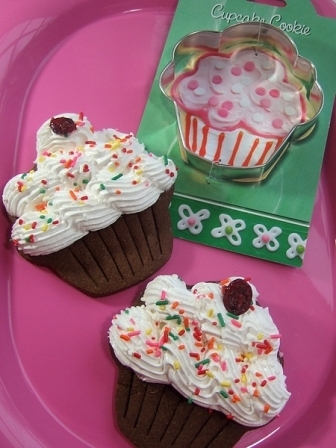 My favorite shape for Chocolate Cupcake Cookies is, of course, the Cupcake cookie cutter. But this combination of cookie and frosting would also work well using the Sheep cookie cutter or the Snowman cookie cutter.